Magic and a little twist of mayhem will charm fans of Sarah Mlynowski, Lauren Myracle, and Wendy Mass in this fresh, contemporary debut! When a package arrives in the mail for Cleo Nelson, she can’t wait to open it. The birthday present is seven months late, but it’s from Uncle Arnie and that can only mean one thing: magic! Inside is a voodoo doll complete with instructions for making happy, wonderful things happen to Cleo and her friends—err, friend. Just one, really. 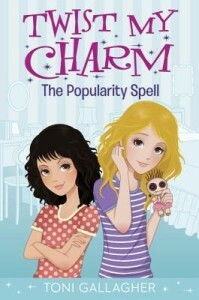 But maybe the doll can change that. . . .
Cleo can’t wait to try out the magic with her friend, Samantha. They start small by wishing for treats (surprise pizza! ), but then their spells start to grow. And when they wish for popularity, they accidentally get the popular girl in school in major trouble with the principal. Can happy spells be twisted into bad magic? I don’t read much middle grade – Okay, I never read middle grade. But when this book was pitched to me, it sounded like a really fun, intriguing read. Plus, the author was a TV producer for Disney’s Bug Juice. So.. Umm.. I had no choice but to read it!!! And I ended up really enjoying it! The characters in this book were extremely relatable and yet extremely hard to relate to. I know, those two statements are completely at odds. But let me explain – I’m used to reading books with older characters. And at times, it was really hard to remember that the characters in this book were only around eleven and twelve years old. Sometimes, I caught myself thinking, “Wow, that was REALLY childish and immature,” only to stop and remind myself that they ARE children, so of course they’re going to react and behave to certain things in certain ways. That being said, Cleo was a fun, relatable character. She was the awkward new girl who didn’t have the right hair or clothes and who was bullied by the mean girl – things that anyone, at any age, can relate to. She’s dealing with living in a new place and going to a new school, along with the realization that her dad is starting to seriously date someone. That’s a lot for anyone to handle! I admired Cleo’s ability to realize she was in over her head and needed help a few times. She realized when things had gone too far and knew she had to put a stop to them. Overall, I loved her character and personality. Samantha’s a tough character to talk about because I really didn’t like her, but the reasons why I didn’t like her.. Well, again, some of the things she did were really childish and mean. But, like I said earlier, I have to remember that she IS a child. On the other hand, her age is no excuse for the way she treated Cleo. She was a bad friend, plain and simple. I understand why she was upset and I understand why she did a lot of what she did, but still. I’m happy with where her story ended, though, and excited to see what happens with her and Cleo in the second book. Madison’s another tough character to talk about. I very strongly disliked her in the beginning. She reminded me of every mean girl I’ve ever encountered – and tried to forget – in my life. Couple that with the things she did to Cleo and Sam and you can see why she wasn’t likable. Once we got to know her better, though, I understand her actions and where she was coming from. Her personality did a major 180, roughly half-way through the book and I started to feel sorry for her and like her more. I REALLY like how her story ended and can’t wait to see more of her in book two! I really liked Terri. She tried so hard to be kind to Cleo, to get on her good side without overstepping her boundaries. But Cleo was very stubborn and unkind to Terri. I understand why – to a certain extent – but it still made me sad. I loved Cleo’s dad and Terri together – they were such a fun, cute couple! I was shocked by the way Terri’s story ended and I’m crossing my fingers that something will change for her and her story in book two. The middle/end of this book was pretty crazy and intense. I was shocked and saddened by some of the things that happened. But, overall, I really liked the way it ended and I’m very excited to get my hands on book two and see what happens next for Cleo, Sam and Maddy, as well as Cleo’s dad and Terri. If you’re a fan of middle grade and magic, then you’re going to love this one!